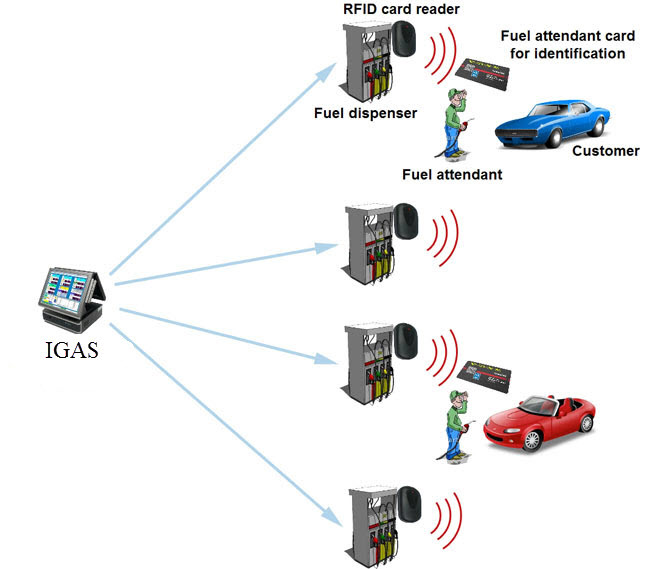 IGAS fuel cards system for petrol stations – hardware and software complex, appointed for provision and account of fuel sales at petrol station networks using fuel cards with fuel volume, money and discount wallets or their mixtures. The system allows to replace usage of cash and coupons to more reliable and convenient settlements using fuel and money cards. Card of the IGAS system can be used for filling with petrol at petrol station and reception of a discount. The system allows to issue fuel and discount cards for customers and also to lead management over cards and account of all sales using these cards with management over accounts of customers and possibility to set flexible system of discounts. 1. 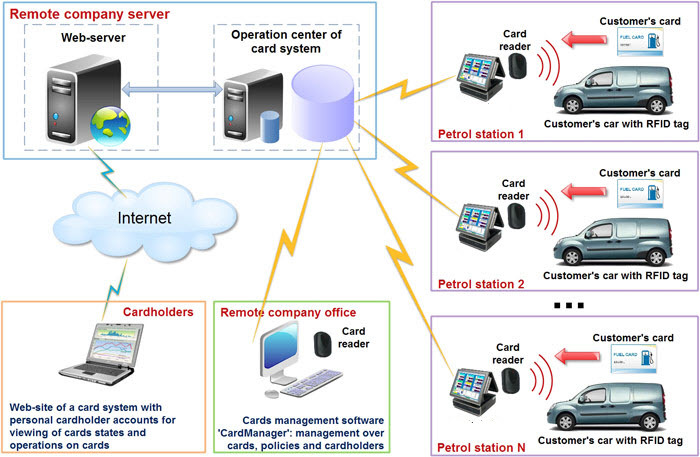 Application of fuel cards by clients of the petrol station (private customers or corporate users). In this case cardholders are clients of the petrol station. Card readers can be installed near each fuel dispenser or near the NaftaPOS system inside the cashier premise of petrol station. If IGAS systems works in the Preset mode of control over fuel dispensers – then after giving a command for dispensing in IGAS system it will request a card to be brought to the reader for identification. The authorization command will be sent to forecourt controller in case if there is enough balance on the card to make ordered sales. In case if IGAS works in Manual mode of control over fuel dispensers – then first it is necessary to select fuel grade for dispensing (by taking up required nozzle on fuel dispenser) and after that to bring a card to the reader (reader will be beeping and waiting for the card). Dispensing will be authorized with maximal limit of the card. 2. Application of cards by fuel attendants of petrol station and building reports on activity of each fuel attendant. In this case fuel card is used for identification of fuel attendants, who are servicing at petrol station. The dispensing can only start in case if fuel attendant brings his fuel card to the card reader, which is installed on the fuel dispenser. The card reader reads the fuel attendant ID card and IGAS system verifies it in the local cards database. IGAS system will authorize the dispenser only in case if the card of fuel attendant is valid and allowed in the system, so without a valid fuel attendant card it is not possible to start dispensing (no one can steal petrol by start dispensing himself). Fuel attendant receives payment from clients. When sale is done IGAS saves in local database information about performed sale: dispensed fuel volume, received payment amount and ID of fuel attendant, who serviced the dispensing. IGAS system any time is able to generate a report on activity of every fuel attendant and total cash money amount, which the fuel attendant received from customers and should return to petrol station owner. Various types of identifiers can be applied in the system: RFID-cards, cards with magnetic strip, chip cards, barcode cards, various dongles, others. Current version of the system is supplied together with RFID-cards of EM-Marine or Mifare standards (cards of Mifare standard are considered to be more secure compared to cards of EM-Marine standard). For protection of card from unauthorized usage any card in system can be protected with a PIN-code, which cardholder should input every time he uses his card. Card in the system serves only as identifier of a cardholder and does not store any other information. 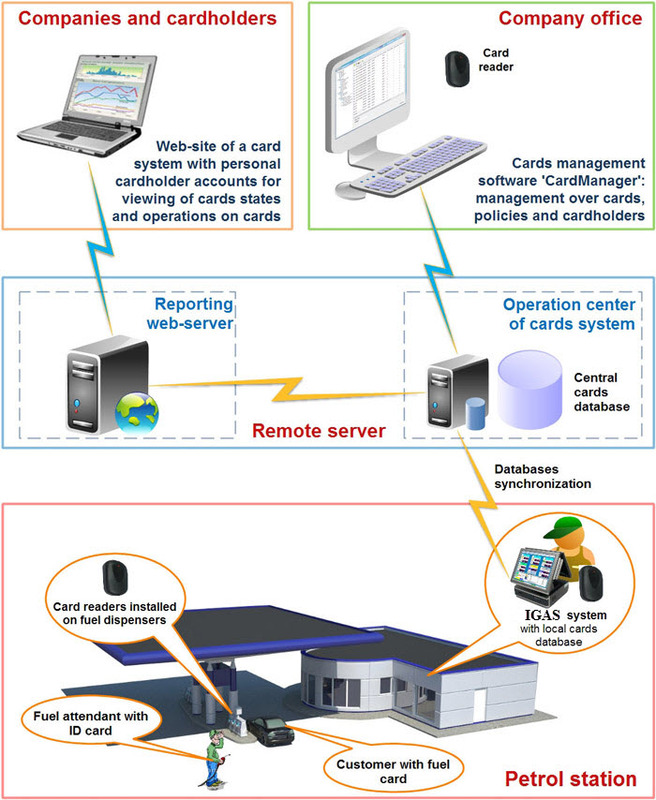 All data from card (personal information of cardholder, PIN-code, his account, policies linked to the card, other information) is stored in operation center central cards database, information about remains on cards account and remained daily limits are also stored in IGAS local cards database. Due to such approach it is not possible to hack a card to get this data and at lost of the card the account of cardholder will not be lost or damaged anyhow, it is easy to block the lost card and issue another card to customer, by linking the existing customer’s account to a new card. Each card can contain one or several wallets. Fuel wallets are linked to specific products (fuel grades). Money wallets are linked to currency types. Depending on combination of wallets possibilities of the card can be significantly extended. For example it is possible to add money and discount wallets on the same card. Such a combination allows to provide cashless settlement at payment for product (money wallet) and at once get a discount on existing policy (discount wallet). Every cardholder can have any quantity of any cards, on which in system a balance is fixed. Given balance is separated into money balance (total money sum, on which purchases in system were made) and volume balance (in liters, in case of fuel) for each type of fuel. Data on client and his balance is managed by company-owner of the card system. In case if on the same product the client has several discounts – then these discounts are not summarized, but the biggest one from the discounts is applied. CardManager software is intended for management over the IGASCards fuel cards system (cards registration, cards issue, refilling of cards accounts, blocking of cards, etc) and also has possibilities for configuration of the Operation Center software: management over users, registration of clients, control over list of companies-cardholders, lists of products, others. Also the CardManager software has a possibility of reports review, which are connected to movement of cards, states of wallets, information on products sales, others. Web-site of fuel card system is intended for owners of IGASCards fuel cards system to generate reports on the system operation. Owner of the system can create its own private cabinet on the web-site and review reports on all operations performed in the systems. Thus using a standard web-browser it is possible to receive reports on operation of IGASCards systems at petrol stations and also to online monitor their activity. Copyright © 2019 adm.com.vn. All rights reserved.